A picture FRAME is a decorative edging for a picture, such as a painting or photograph, intended to enhance it, make it easier to display or protect it. A DIGITAL PHOTO FRAME (also called a digital media frame) is a picture frame that displays digital photos without the need of a computer or printer. 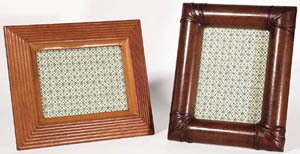 The introduction of digital photo frames predates tablet computers, which can serve the same purpose in some situations; however, digital photo frames are generally designed specifically for the stationary, aesthetic display of photographs and therefore usually provide a nicer-looking frame and a power system designed for continuous use. Best Digital Photo Frames of 2017 - TopTenReviews. The Best Digital Photo Frame - The Wirecutter. Addison Ross - since 1978. ARMANI / CASA - frames by Giorgio Armani. Arthur Price of England - "Frame it. Treasure it." The art of cutlery and silverware since 1902. Large selection of sterling silver frames. ASPREY - "British Luxury Goods Since 1781." Silver frames. BACCARAT - Harcourt clear crystal Abysse photo frame. 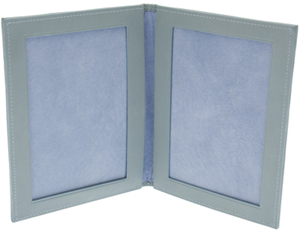 BENTLEY - Ettinger Leather Two-Fold Photo Frame. Bottega Ghianda - Pierluigi Ghianda picture frame made in pear wood. 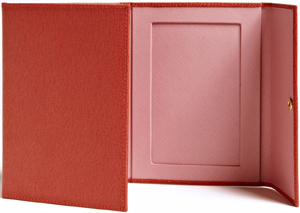 BOTTEGA VENETA - nappa photo frame. Carrs Silver - "Premium English silverware hand-crafted at our factory in Sheffield. Family run since 1977. Where it all started for Carrs - our timeless photo frames easily add elegance to your home. 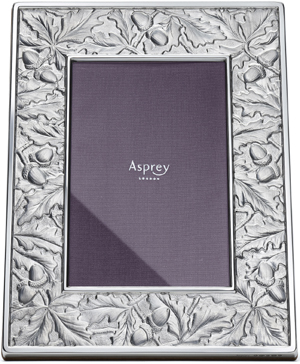 Our silver sterling and silver plated frames come in a huge range of styles and sizes. If you’re looking to add that personal touch we also offer an engraving service on many of our picture frames." CARTIER - wood photo frames. Cavagnini - pewter photo holders. Cedes Milano - handcrafted nickel plated brass picture frames. CHRISTOFLE - engravable picture frames. 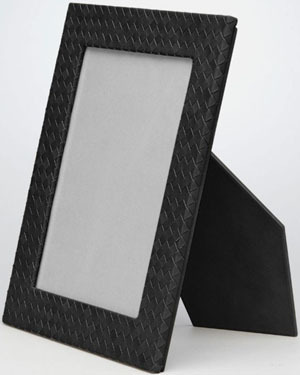 Cipriani - Stingray valet tray / photo frame. Etro Bangoli Frame - Exotic paisley patterned frame. ETTINGER - since 1934. Leather frames. Fortuny - since 1919. Italian manufacturer of luxury, hand-made textiles and home furnishings. FOSTER & SON - est. 1840. Traveling photo frames. Frette - since 1860. "There's nothing like Frette." GEORG JENSEN - since 1904. Art Deco silver frames. 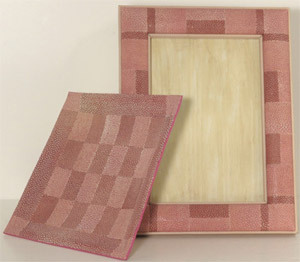 KATHERINE POOLEY - shagreen picture frame with nickel plated chain design and leather back. Kodak Easyshare W1020 10-Inch Wireless Digital Frame - wireless access to pictures on your home computer and leading photo sharing sites featuring Kodak Gallery and Flickr with built-in Wi-Fi capability. L'Objet - all frame collections. Laura Biagiotti - wedding photo frames. 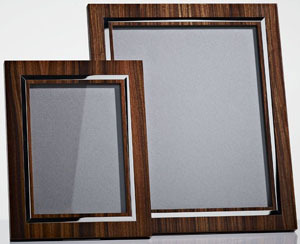 LINLEY - sterling silver & walnut photograph frames. Louis Vuitton - all models. Lucrin - founded in Switzerland in 1994. Photo frames. MATCH - "Pewter Handmade in Italy." MICHAEL ARAM - since 1989. Renowned for his outstanding artistry & innovative design. His work elevates life’s everyday moments so their natural beauty shines through. Monique Lhuillier - Waterford Opulence Metal 5×7 Picture Frame. 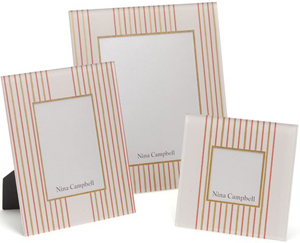 Nina Campbell - Abbotsford Aqua photo frames. PARROT - Wi-fi Bluetooth wireless digital photo frame. Pettinaroli - since 1881." 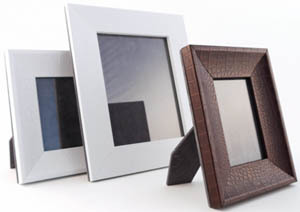 Photograph frames in wood and leather. PICKETT - "Classically designed luxury leather photograph frames." PINEIDER - since 1774. Calfskin large red picture frames. Pinetti - since 1983. Italian hand madeleather photo frames. Puiforcat - since 1820. Art Déco & contemporary picture frames. RALPH LAUREN - silver-plated & leather photo frames. Reed & Barton - since 1824. Sage Brown - mini leather travel photo frames. SILVER GROVES - sterling silver photo frames. SMYTHSON OF BOND STREET - since 1887. Leather photo frames. SWAROVSKI - founded in 1895. Picture frames. T.Anthony - since 1946. Leather photo frames. The Little Market - woven picture frames. The White Company London - since 1993. "Everything you need for stylish living - mainly in white." All models. Theo Fennell - since 1952. Sterling silver photo frames. TIFFANY & CO. - sterling silver frames. WATERFORD - founded in 1783. Crystal picture frames. WEDGWOOD - since 1759. Silver, gold & leather photo frames. WILLIAM & SON - silver photo frames. WILLIAM YEOWARD - since 1998.